Gladys begins the month with the seed catalogues. Now some of them come in the mail before Christmas. But one thing never changes. The lure of those pictures and words pulls the gardener in every time. Gladys even wrote a bit of doggerel about it. As on P. 20 and the rest. Blossom in catalogues without our hoeing. I love it when Gladys tells of days gone by. … a party for my gang. We just swarmed all over everything and ate like mastodons. Rolled up the Orientals and danced. Finished off with hot chocolate beaten with Mama's Mexican beater and with cinnamon spicing it, and dollops of heavy sweet whipped cream - plus the rest of the tiny heart cakes. And finally, when Valentine's Day was really over, … a moonlight walk with my beau along the snow-deep streets of the little town. Light years away from drinking games and more-than-romantic-walks at the end of the day. Gladys writes of a topic close to my heart. I've written before about mystery heroines who drive me crazy by taking unnecessary chances. Apparently this is not a new phenomenon. I shall quote quite a bit from this section since I found it so interesting. Jill has been reading the current mysteries. I read two and got so cross. My quarrel with mystery writers is that their heroes and heroines behave so stupidly that I lose patience with them right off the bat. The heroines always go sneaking about dark houses at midnight after a murder, just looking for a good book to read. The heroes rush into black alleys looking for a guy who knows all - and finds him all right. Nobody on the right side ever carries a gun. If he is a cop, he leaves it at home, if a newspaper man, he doesn't care for guns. Hero and heroine always tell all to anybody around, who is, naturally, the murderer or his best pal. They get into strange autos, they go into dives just for the fun of it apparently. And when they really know who murdered Mr. Bascom, they go right up to his hide-out like a Fuller Brush salesman and take him to task in a very moral but impractical way. At this point, I feel they deserve to be killed. … The author always saves them, but are they worth it, I ask. 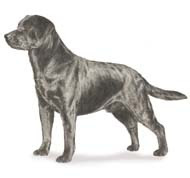 Having just watched the Westminster Dog Show, it was most interesting to read about the difference between dog shows in the United States and Canada in the 1940s and 50s. Jill, her housemate, is not only a dog handler, but also a well-respected judge in the dog world. They go up to Montreal to a show. The show was a real experience. Jill judged for six hours, I should say, and in all that time there was hardly a sound. The gallery sat so still that one had to whisper if one wanted a glass of water. There never was anything like this in the United States. At our dog shows you yell to be heard. The concentrated attention was terrific. Jill said it took her an hour to get used to her voice being the sole one booming out as she gave commands. Most of these Canadians were interested in one aim, to have their dogs educated, to do a better job themselves. If they failed, they accepted it quietly. Whereas often in our country, a judge can be mobbed by disappointed handlers. Country living in these days may be rather effete, with music at the turn of the knob, news over the air waves every few minutes, books coming in the mail - and then you can see and hear a whole opera if so minded, on television. We live in an age, it seems, when the whole world is at our doorstep, no matter where we may be. Letter writing has fallen out of common practice of late. As is pretty much the case each month, Rachel's writings are centered on the down-to-earth observations of farm life. Yet she is lyrical and poetic in her descriptions of what might be considered the more mundane activities. She sees beauty, and philosophical applications, and often, humor in most everything. In February a farm is like a child's hand, opened and held up to show that nothing is concealed in it. Without leaves to veil the farm buildings and fields, the naked facts of a farmer's work habits and holdings are revealed even to the casual traveler passing along the road. Nothing is hidden in February. In this passage the reader can almost see and smell what she is writing about though probably few of us know it firsthand. In the doorway of the barn, a wheelbarrow, freshly filled with silage, was standing. Steam was rising up from it into the cold air, like steam from a gigantic kettle of soup just taken off the stove. At this time of winter, silage still has a pleasant pickledy smell, with a suggestion of sorghum. Cattle like it. The cows in the barn could smell the steam and were bawling in happy anticipation. spices, medicines, nose drops, cough syrup, liniment, fly spray, vitamins, pudding mixes, and cosmetics. Predation is a natural process, and biologists believe the way to more abundant wildlife is not through the killing of predators but through the management and strengthening of the environment. barrage of roadside spray, giving the summer an early-dead appearance and an unpleasant chemical smell. What the effect of roadside spraying may have on insects and birds and small wild creatures that would have dwelt under the vegetation is not pleasant to think about. When the early, northbound robins get here, they will be observed by conservationists fearful of the bad effects of roadside spraying. For the danger is in earthworms that come up temptingly at night, exposing their long, pink and gray moist deliciousness to the hungry robins. Earthworms store up DDT in their bodies; but robins do not realize this, and unfortunately, there is no way to warn them. She tells us the realities of farm life, and adds humor to temper the seriousness. He takes his family's living in his hands when he decides whether to sell the steers now or borrow $1,500 more from the bank to finish them out for market, and risk a drop in the market price. … Shall he set fifty acres of tomatoes, risking a hot, dry summer and a shortage of hand labor to pick them? … Shall he mow all twenty-four acres of a field and risk getting it rained on before it cures, or shall he cut half and lose the extra time? But in hauling manure he can never lose. It is life to his fields. Regardless of whether the crop is surplus and gluts the market and swamps the national farm policy, or scarce and precious, the soil has to be maintained. A manure-hauling farmer knows he is doing the right thing. The only trouble is, everybody else in the community, and everybody driving past, knows it, too. On windy days, a manure-hauling farmer couldn't attract more attention if he were driving a steam calliope. Three quarters of my year with Gladys and Rachel have now gone by. Reading these monthly essays are a most pleasant way to mark the passing of time, theirs and mine. road across the fields to the open barn. 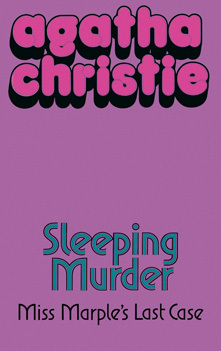 Carla Lemarchant comes to Hercule Poirot asking that he investigate a sixteen year old murder case. When she was five years old, her mother was arrested for murdering her father. She has lived with relatives in Montreal since, and when she turned twenty-one was given a letter her mother wrote to her from jail just before she died, saying that she did not do it. It is neither here nor there to Carla. She believes her, and that's that. But she is engaged, and has fears that if she and her fiancé have an argument, he might look at her askance, wondering if she might have inherited her mother's propensity for killing her husband. He denies this, and says he doesn't care, but she still wants Poirot to look into the events of all those years ago, and she hopes he will find her mother innocent. This may be the most unique of all Agatha's books, for it takes place almost entirely in the memories of the five people who were involved. The title comes from the old nursery rhyme. Philip Blake is the little pig who 'went to market.' He left his family estate and became a successful stockbroker. His brother Meredith is the little pig who stayed home. He is a quiet man who dabbles in herbal concoctions. Lady Dittisham, Elsa Greer as she was then, is the little pig who had roast beef, having married rich husbands and lived in luxury. Cecelia Williams is the little pig who had none, a governess who watches her pennies in her retirement years. And the last little pig, the one who cried 'wee, wee, wee all the way home' is Angela Warren with the disfigured face. As usual, I didn't guess the culprit. I was sure a couple of times that I knew what the solution was, but I didn't. 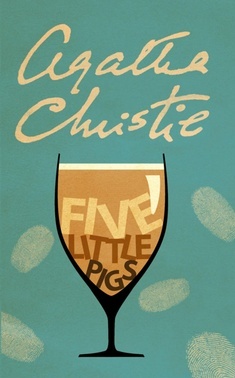 Five Little Pigs is one of the more complex, psychological mysteries, and in my opinion, one of Agatha Christie's very best. I found two other reviews of this book from Kerrie, and Jo. offered the original covers - the one on the left shows the American title, and the right is the English version. I learned that Alderbury, Carla's childhood home and the scene of the crime was based on Agatha's beloved Greenway. The name of Carla's artist father was based on a real person from Agatha's past, from her days of amateur theatricals. Also performing was one Amyas Boston, whose first name Agatha pillaged for the strong-willed artist and murder victim in Five Little Pigs. In her autobiography, she recalls a romantic moonlight picnic with him at Anstey's Cove, where they sat holding hands and not speaking. How I love thinking of this woman as a young girl much like any other of her day. And I was thrilled to see this picture of the battery, where Carla's father breathed his last. ... known as the Battery garden... It was situated at about four minutes' walk from the house. 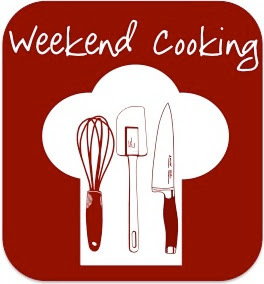 I haven't contributed to Weekend Cooking since the new year began. I haven't been on the computer too much on Saturdays and Sundays, and I haven't been making anything new-to-the-blog. It's been a few weeks of old favorites which I've already posted. But here is a new one which will warm any chocolate-loving hearts. They are very easy to make, and are a most delicious treat. We shared them with our dear neighbors down the road (see The Making of a Home under Letter Topics) who raved about them. Spread the mixture into a greased 8 x8 or 7 x 11 pan. Bake at 350º F. for 30 minutes. Frost the squares while they are still warm. I have heard from a few people that they are having trouble with the word verification. I have noticed in the past week that blogger has changed it. It used to be a little word, but now it is one printed clear word and a second word that is quite difficult to read. I've had to do it two or three times on other blogs. So, I am getting rid of it here. It does give me more spam, but there's a spam folder and I'll just empty it. No big deal. Some may look forward to the World Series, the Super Bowl, the Academy Awards, or the Grammys as their favorite television viewing of the year, but for me that special occasion happens on the second Monday and Tuesday in February, The Westminster Kennel Club Dog Show. It is an annual event in my life and here on the blog. Other than the time we didn't have satellite tv, I have written about it every year. It does, in fact, have its own section under 'Letter Topics,' and you may click there to read the dog-related ramblings from years past. As you know, I really love dogs, and one of my personal favorite postings was a litany of all the dogs who have shared our lives since 1973. I take the choosing of a dog very seriously, and so I sit down each year with paper and pen in hand, jotting down descriptions that appeal to me. A dog in the show may be adorable, but unless I hear such phrases as 'unsurpassed family dog' or 'gives visitors cheerful welcome' or 'loves children' then I will continue to admire them on television only. As I've noted maybe too often here on the blog, our Sadie doesn't like anyone but Tom and I, Margaret, and Michael. If, for example, Matt is at the door with Margaret, you can see the extreme internal conflict Sadie goes through. She loves Margaret more than life itself, but Matt is a stranger and a danger from whom she must protect Margaret. So, into the laundry room she goes whenever anyone stops by who isn't part of the family. Luckily, she doesn't mind, and is quiet and well-behaved the whole time they are here. It's like she knows we are protecting her from herself. So, without further ado, here are my choices from this year's dog show, with those wonderful American Kennel Club drawings. Though last year I featured the Leonberger, and though I am still smitten with its looks, I read it can be rather short-lived and prone to some diseases so I think I will forego this breed. 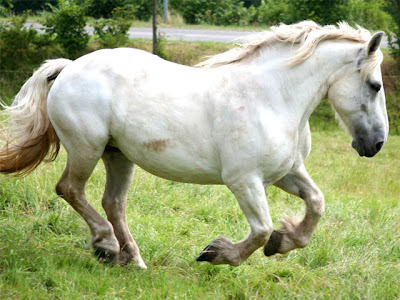 Some of the large breeds we are fond of also have shortish life spans, and frankly, though there are no guarantees, I'd like a dog that might live longer than 7-9 years. We lost two after seven years, and our dog-loving hearts broke. 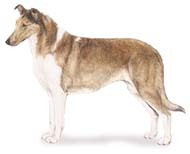 First and foremost is the Smooth Collie. I've noted before that we didn't have enough years with our beloved MacIntosh; and we want the Smooth over the Rough for ease of grooming. All of these dogs would fit in just great at Windy Poplars Farm. Wouldn't it be fun to have six puppies, one of each breed?! So there you have it. Another year, another list from the best two television nights of my year. 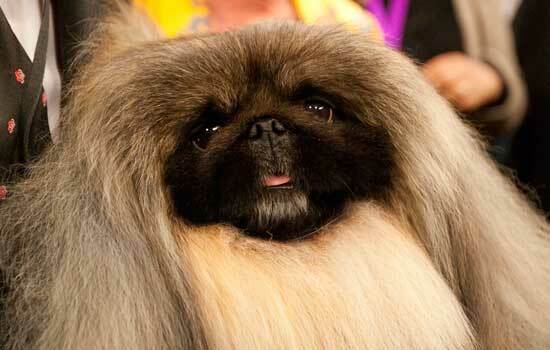 I can't close without taking note of this year's winner, an adorable Pekingese named Malachy. Oh, the way he walked made me smile with delight, and that dear little face! And I just loved this Purina commercial. 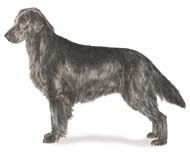 If you are unprepared to potentially lose a dog at a young age (the average lifespan of the FCR is 7 years), then the Flat Coated Retriever is probably not the breed for you. I can't get a dog with that expectation after having lost both MacIntosh and Ben at the age of seven. 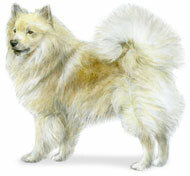 So, I am eliminating this potentially wonderful breed from my list. That Icelandic Sheepdog is looking better and better. 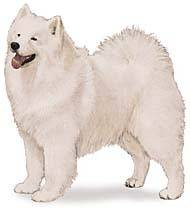 After a mention in The Apothecary by Maile Meloy, which I finished today, I looked up the Samoyed, and wondered why the breed wasn't on my list. 'Bright, alert, gentle.' I'm adding this one. Look at that smile! Last evening I met a new-to-me breed. Our friend Billy has an Irish Terrier named Murphy, and for me it was love at first sight. He was cheerful and interested in us, but clearly loved his Bill. He has an impish, almost comical quality that was so appealing. 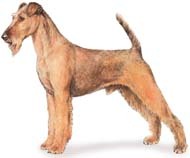 I've been doing a lot of reading and now the Irish Terrier is high on my list. I offer this song on St. Valentine's Day as a reminder that all kinds of love may be celebrated today: love of boyfriends, girlfriends, children, books, gardens, pizza, cats, and dogs! A St. Valentine's Day yawn from our Sadie - just another good day for a nap! Come thronging back to me. And castles by the Rhine. And gleams of distant seas. O'er many a lengthening league. Better than with mine own. I didn't set out to visit three fictional retirement homes in the past few months, but somehow I ended up doing so. Each one has been enlightening and enjoyable. The first was the Phil Edwards book Retirement Can Be Murder, and the second one was the movie, How About You. 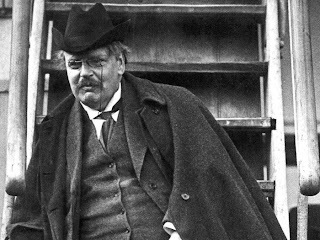 If you'd like to listen to Strauss' Tales From The Vienna Woods as you read along, you may find it here. I have recently joined Goodreads. I haven't written any reviews there, but I have created three lists: currently reading, to read, and read. This is where I first heard of A Place To Die. I am very interested in post-war/modern day Austria and Germany, and this is the first fictional book I've come upon which explores the lives of everyday people there since the Second World War. I would appreciate any recommendations you may have. I am also interested in portrayals of older people. If we are lucky, we shall inhabit their landscape. Eleanor and Franz Fabian have come over to Vienna from New York for the Christmas holidays to visit Franz' mother who has recently moved from her apartment to Haus im Wald, a facility for older people in the Vienna Woods. There are people living there whose ages span thirty years from Christa, in her sixties who happens to be an old acquaintance of Eleanor's, to a retired Baptist minister who is 93. There are two sections. One offers apartments which are much like ordinary homes, while the other is where those who need nursing care live, and usually where they will die. The Fabians' experiences are interspersed with the detective work of Inspektor Georg Büchner. He enters the story because there has been a murder at Haus im Wald. Herr Hans Graf, a healthy, active man in his seventies has been hit over the head in his apartment. Four people have already died in the month of December, and though they died natural deaths, this latest death has everyone on edge. Dorothy James did an excellent job of bringing the characters to life. I didn't have to go back and see who someone was, as I often do in books with a lot of characters. The author also brought authenticity to the setting by using, as I've shown above, some of the native words and spellings. The women are all 'Frau' and the men, 'Herr.' Occasional forays into the city proper gave me a good sense of Vienna. Vienna is a small town you know, it's not London or New York. The period of the Second World War is rarely discussed amongst the inhabitants themselves. Silence on certain topics has been a way of life. came round much later to seeing the gross injustice of all that. 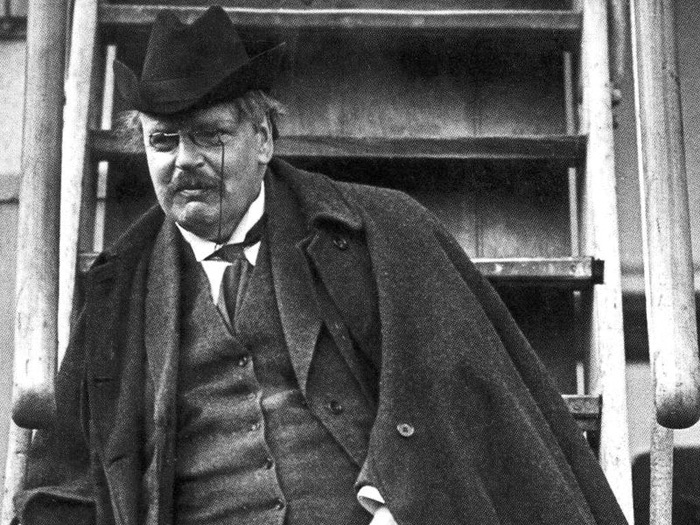 … he made large contributions to restitution funds, though … there are those who still think he has certain debts. Could this be connected to his murder all these years later? Or is someone jealous of his romantic relationship with a beautiful former opera singer who also resides at Haus im Wald? While investigating the murder, Inspektor Büchner learns of anonymous yellow post-it notes which many residents have received. They are extremely cruel and lewd. There is a lot going on in this place. This is a book of truths. 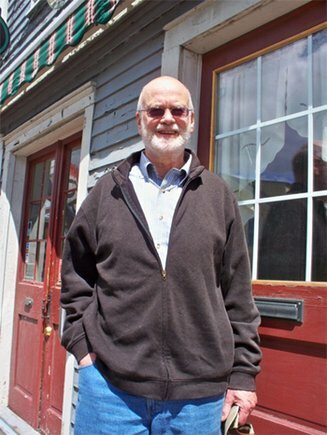 Old age is not something that is glossed over, or presented in a perky, upbeat way. The Inspektor and the Fabians are people in their fifties and sixties looking ahead to their own older years. The older ones live honestly with their aging. They fear loss of faculties and they fear falling but honestly, their emotions are not all that different from those of the young. We see that the old have all the passions, angers, and joys that younger people have. There are many stories within the walls of this residence, and we get to know them all. Haus im Wald is a fine place for those who have the money. A contrasting facility is noted for those who do not. There are musings about how it would be better if there were a gym, offering exercise and strength training, and an opportunity for massage instead of drugs. This is really a wonderful book, unlike any work of fiction or mystery I've read. It is quiet and thoughtful. I've mentioned that I use my Kindle only for bedtime reading, for ease of holding. But while reading A Place To Die, I brought it down every morning, and this became my 'downstairs' book as well. It is intelligent, caring, informative. I can't wait for Dorothy James to publish a second book in the series. Büchner is such an interesting character - a loner policeman who has never married, but isn't really lonely. There is another character I suspect may make an appearance in further Vienna stories. 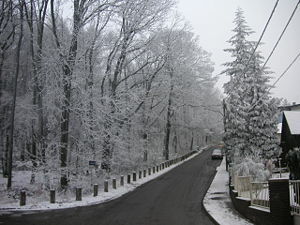 Here is a view of the Vienna Woods in winter. The weather, the resident rooks, and the very air are so well-drawn that it almost feels like being there as one reads along in the book. You may read some brief reviews at Goodreads. 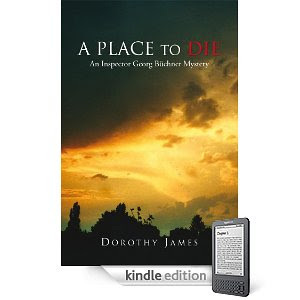 There are interviews with Dorothy James at I Am A Reader Not A Writer and at The Character Connection. 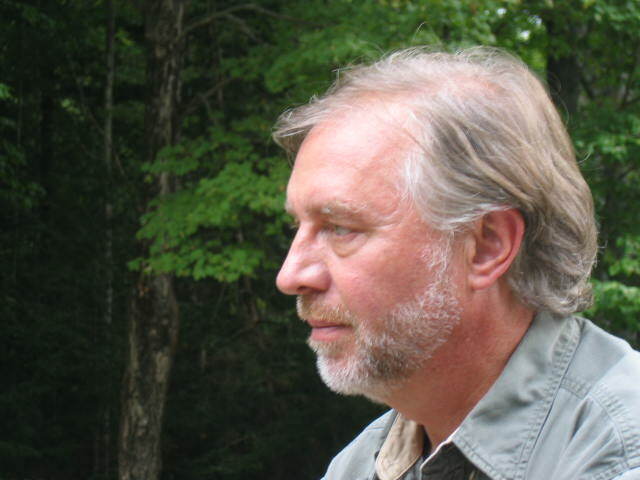 The author's blog is here. What you need, I think is a little bit of Zen. … tremendously refreshing. There's a great deal to be said for letting things happen. That's it, you see, without control. But - but that's frightening. On the contrary, it's much less painful than fighting every step of the way, and so much more delightful than trying to arrange life like a table setting, which one can never do anyway. Really, it's quite exciting to see what will happen next. At your age there are still surprises? Mrs. Pollifax beamed at her forgivingly. 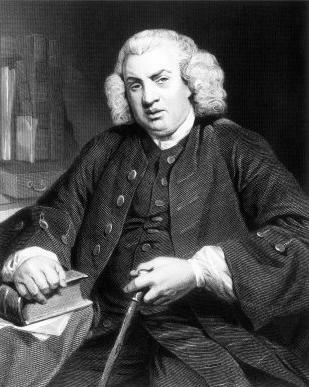 Frequently I can assure you, some pleasant and a few not at all pleasant, but of course one can't have the one without the other. It's impossible. This was published posthumously, and is referred to as 'Miss Marple's Last Case,' though happily for the reader she is not infirm, nor does she die. In fact, I thought her more sensitive, and sharper than I've seen her before. The beginning of the book is rather like one of those movies that starts off bright and sunny, when quite suddenly a feeling of unease creeps in. Though it doesn't get as scary and bizarre, I was reminded a bit of Rosemary's Baby in the first section. Gwenda and Giles have just gotten married in New Zealand. Gwenda has come to England to find them a house, while Giles will come later. She finds the ideal home. She feels completely comfortable, and though it needs some work, it is the perfect place. One of the areas that needs work is the garden path. The steps and walkway off it are in the wrong place. Instead of approaching the sea view directly, it is off to the side. Where the center walk should be there is a bramble of bushes. Odd, but not startling. When Gwenda wants to go from one room to the other, she gets up from her seat and without thinking heads right toward a wall rather than a less conveniently placed door. After this happens a few times, she tells the workmen to cut a hole in that wall since it is clearly the place a door should be. When they get working, they tell her the door used to be there. She has a specific wallpaper in mind for a bedroom, poppies and cornflowers. When a painted-in closet is opened up, she finds that exact wallpaper on the interior wall. So, the reader begins to get little shivers. What on earth is going on here? One evening she is invited up to London by the Wests, Miss Marple's nephew Raymond and his wife Joan. Along with Jane Marple, they attend a performance of The Duchess of Malfi. All is fine until the words, 'Cover her face; mine eyes dazzle; she died young' are spoken. Gwenda screams and runs off. She tells the kindly Miss Marple that when she heard the words, she saw in her mind's eye, as if she were looking through a banister, a woman named Helen being strangled by a man speaking those very words. Miss Marple finds the word 'through' to be most instructive. That means that Gwenda was a little girl who wasn't tall enough to look over, but had to look through. So, did Gwenda witness a murder when she was little? Why is this house so well-known to her if she believes she has never been to England before? When Giles arrives, he and his wife and Miss Marple begin looking into the situation. The title is a play on the words, 'let sleeping dogs lie.' In Miss Marple's view it might be better to let it be, to not investigate because it could lead to terrible truths which have been kept secret for almost twenty years. I loved this. Miss Marple had a really strong role which she doesn't always. Her mind is as clear at the end of her cases as it was at the start. Gwenda and Giles are a sweet young couple, and the reader roots for them to come through the horrors that are unveiled without losing their youthful love for each other and love for life. They do. Agatha began two books as insurance for Max and Rosalind, later assigning to Max the copyright of the final case for Miss Marple, Sleeping Murder, and to Rosalind the final case for Poirot, Curtain. I find that incredibly endearing, and also amazing in that she thought her husband and daughter would need an 'insurance' book. 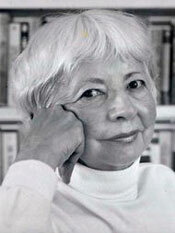 Of course, she couldn't look into the future and know she would be one of the top best-selling authors of all time.